Koshi Tappu Reserve was established in 1976 to protect the last haven of the wild water buffalo on the banks of the Koshi River, and has become one of the best bird watching sancturies in Asia. The barrage across the Koshi River has created a vast expanse of marshes, lagoons and mud flats which are home to large populations of both migrating and endemic species. The water is home to the rare Gangetic River Dolphins and otters, while the dense riverine forest of the reserve harbours deer, blue bulls as well as the wild water buffalo. 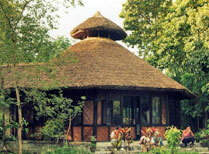 A long-established camp offering homely accommodation and chances to see the varied bird life of Koshi Tappu Wildlife Reserve. There are several airlines flying to Nepal via the Middle East with flight times of 10 to 15 hours depending on the length of the stopover. Required for British citizens, can be obtained on arrival at the airport.